FOUR hypodermic syringes and a motorcycle helmet were among the grim discoveries made by two environmental adventurers as they paddled through Leamington. 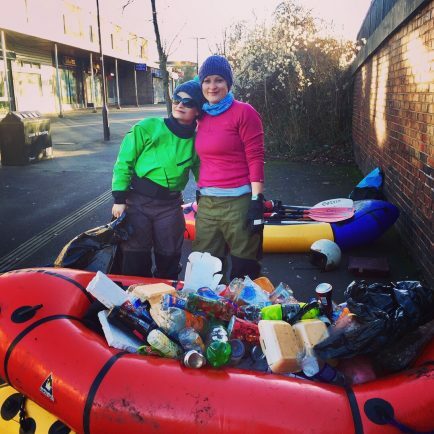 Megan Hoskin and Siriol Griffiths – known as Dare Two Do – are paddling the length of the Grand Union Canal from Birmingham to London on a giant litter-picking mission. They fished some 250 items from the canal – mostly plastic bottles, wrappers and polystyrene – along a 2.5 mile stretch through Leamington on Sunday. The pair are travelling in a packraft – a cross between a kayak and a blow up raft – and are wild camping as they go, and also relying on the kindness of strangers. The duo hope their efforts will lead to people thinking twice before discarding their rubbish. In June Megan and Siriol will be rowing across the Pacific Ocean as part of the Pacific Terrific ocean rowing team, dueing which they will raising awareness of plastic pollution in the oceans, which was also recently highlighted on the BBC series Blue Planet II. The Inland Waterways Association (IWA) hold regular clean-ups of the canal in Leamington and Warwick. The last clean-up in October saw volunteers haul out more than 40 shopping trolleys, 28 cycles, three motorbikes, more than 20 tyres, a complete sign from a pay and display car park, a street sign, several pushchairs, a pram, and various barriers and road works signs. The clean ups take place twice a year. Email info.warwickshire@waterways.org.uk for further details.